Earlier this month, following landslides and floods caused by incessant rains, the district administration had imposed a ban on tourist entry to Kodagu, while also directing all hotels, home stays and resorts in Kodagu not to accept bookings till Aug.31 in the interest of tourists. 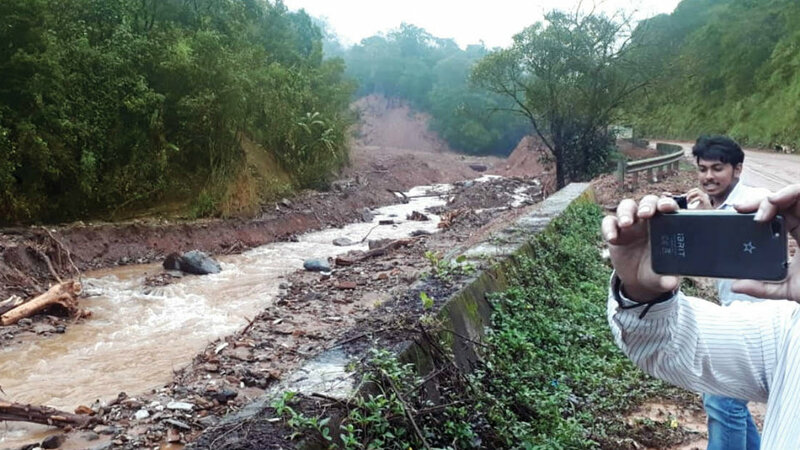 The ban on hotel bookings worked till last week when the road link to Madikeri from Mysuru – Kushalnagar as well as road connectivity within the district were cut off due to numerous landslips. However, as rains gave respite over the past few days, people from the district and other cities as well as tourists, have started visiting the disaster zones, even as officials have warned that the sustained intermittent rain may cause more landslides. This respite has started a new kind of tourism, ‘Disaster Tourism’ where curious people, both locals and outsiders, are thronging some of the disaster-hit areas in and around Madikeri. Most of them are travelling between Madikeri and Virajpet, Mysuru and other nearby towns. Officials are of the opinion that the presence of people in large numbers is an impediment to the free movement of relief materials as existing narrow roads tend to be choked with vehicles and people taking photographs of the affected regions. The authorities, taking note of the arrival of a large number of people including tourists in badly hit areas, have issued fresh directives to hotels, resorts and home stays not to entertain visitors till Aug.31. Meanwhile, Kodagu Deputy Commissioner (DC) P.I. Sreevidya on Sunday warned that action would be taken against hotels, resorts, home stays and other lodging homes, facilitating the visit of tourists to areas hit by landslides. Pointing out that the ban is in force till Aug.31 in the interest of the visitors as their movement in landslide-affected areas could jeopardise their lives, the DC said legal action would be taken against hotels, home stays and resorts if they were found violating the directive and continue to ferry people to disaster-affected areas and other places of interest. The District Police have set-up District Border Check-Posts at seven places, where people are screened. However, some people posing as local residents, enter these areas. Also, some people sneak through the barricades placed to screen travellers, according to SP Suman D. Pennekar, who also said that 14 Check-Posts have been set up within Madikeri to divert people entering these areas.